You have TWO WEEKS to play along - Deadline to enter is Friday, August 17, 2018 at Midnight CST. The winners will be announced on the NND blog the following Monday. Diane Morales begins her card by creating clouds from the Cloudy Sky stencil on a white card base. She then adds layers of waves using the Sea Borders die set. 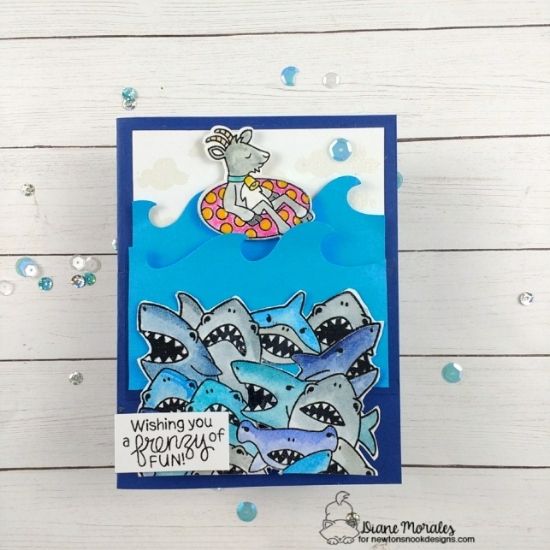 She then creates a scene that resembles one from Jaws with her sweet goat from the Floaty Goat stamp set enjoying a peaceful day while ferocious sharks from the Shark Frenzy stamp set circle menacingly underneath! Emily Lauritzen uses the Seashells stencil on black card stock to create her beach background and die cuts it with the Framework die set. 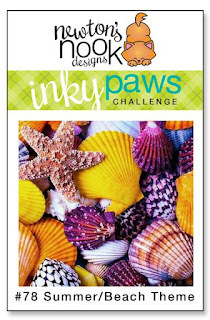 She then makes a watery center and frames it with layers of shells and starfish from the Purr-maid stamp and die set. She then adds her purr-maid with his colorful tail and stamps the sentiment in the watery center. 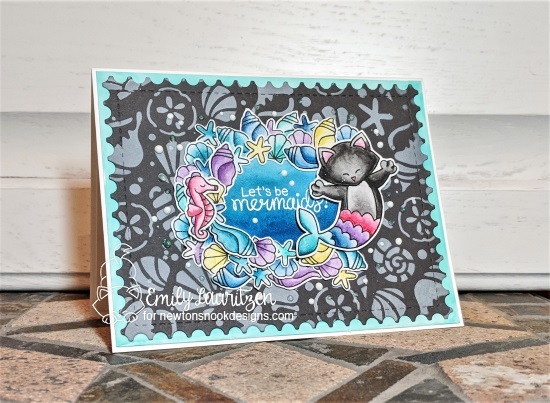 She adds white accents to finish this a-meow-zing card! This fabulous CAS card by Sue T. features the Tranquil Tides stamp set. 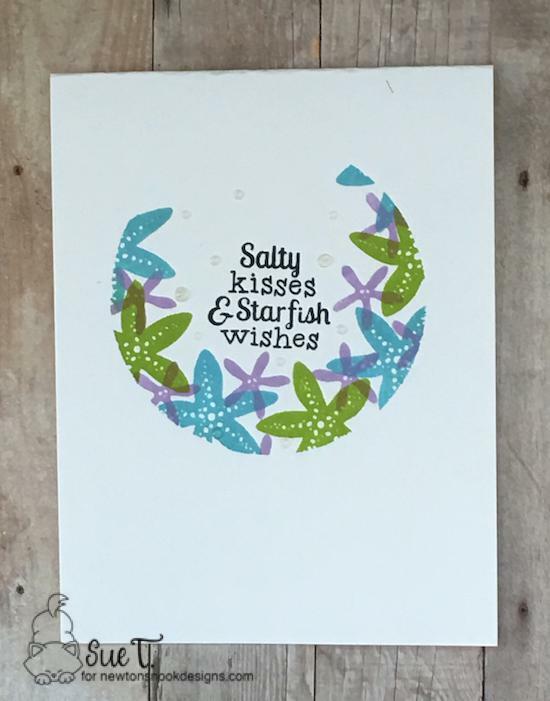 By masking a circle, Sue stamps the starfish images in different colors to create a circle around the fun sentiment. She finishes with some dewdrop accents. Simply spectacular! 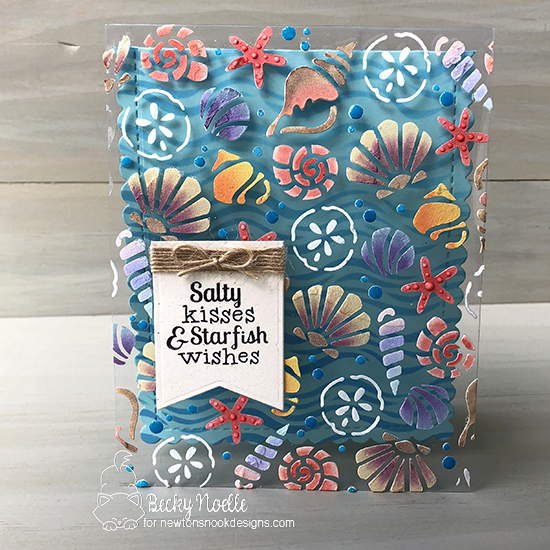 Becky Noelle uses a clear card base to create her card by using the Seashells stencil. The back of her card using the Waves stencil and the Frames & Flags die set. She then creates an extra little card to write a message inside. She stamps her sentiment using the Tranquil Tides stamp set and adds twine wrapped around the little card several times and adds a small bow. Wow! Debbie Owens uses acrylic paint to create the watery backdrop and creates the waves using the Sea Borders die set. Then she inks the sunny sky using the Sunscape stencil. 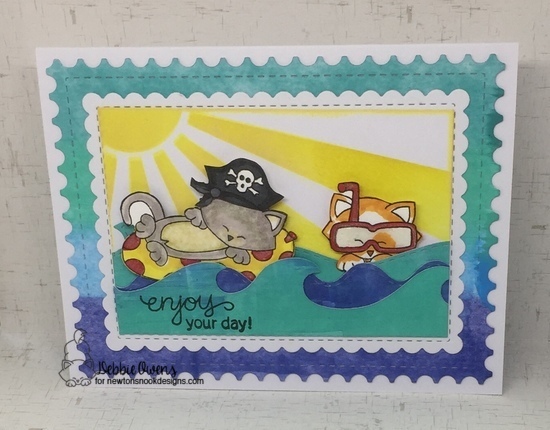 Those cute critters are from the Newton's Summer Vacation and the pirate hat is from the Newton's Costume Party stamp set. She combines the Frames & Flags and Framework die sets to create the layers. Looks like a fun day in the sea! These are all extraordinarily lovely and fun! !